Our ‘big’ vacation in 2015 took us to one of my favorite cities in the world – Paris, France – and we were able to visit the Palace of Versailles this time around. It was as opulent as I imagined it would be as it was built by a king seemingly trying to bankrupt his country. With the political system (no I don’t want to talk politics :)) the way it is today in the USA I have to wonder if someday in the future people will be visiting Washington thinking the same things – when is the last time we had a balanced budget? And finally – safari in Northeast South Africa. It’s going to be an amazing trip and we are both looking forward to the adventures. I’m very fortunate to have married my best friend and travel companion for life! We laid in the grass, ate lunch, took pictures and people watched for a few hours. I snuck away at one point to take some pictures of the surrounding neighborhood but mainly we tried to relax in the shadows of one of the world’s icons. It’s a wonderful city to visit and for those who may be deterred by the events of mid-November I hope you re-consider because there is nothing that should stop you from living your life and seeing all that you can while taking your one trip on this earth. 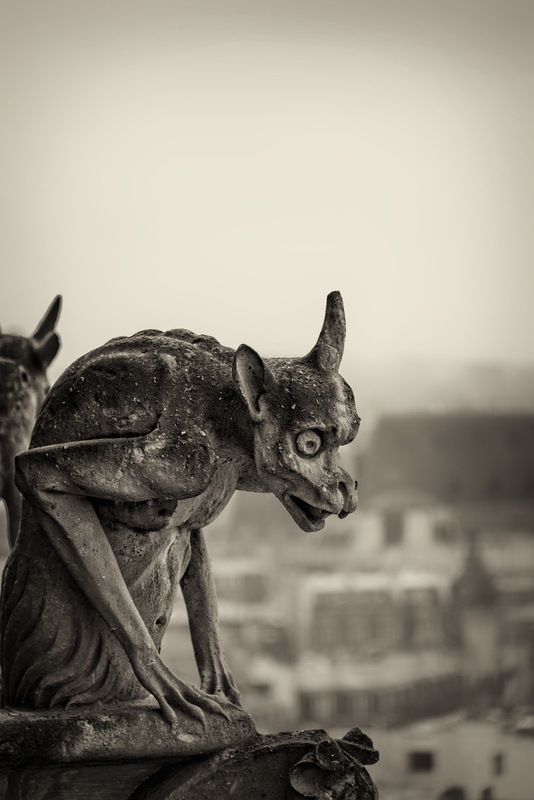 We took a tour of the Notre Dame Cathedral and visited its famous gargoyles overlooking the city below. I don’t think they could have imagined hundreds of years ago when they built the church the events that would have unfolded at its feet in November 2015. It’s been over a week since my last post and since the terrible attack on Paris – a city my wife and I love so dearly. Watching the events as they unfolded on the TV was tough because we had just visited the city back in April. I can’t imagine what those unable to escape the terror felt in those last minutes. It’s unbelievable that in a city like Paris this could happen and with that what does it mean for all of us? Must we stop traveling the world and sit in our homes waiting for evil to be eradicated? We can’t in good conscience do that – we need to travel and experience the joy and beauty of other cultures or else they’ll succeed in making us all as close minded as they are. We won’t let that happen to us and thus we’ve just booked our next big vacation for next April where we will be off to South Africa and Zambia for two and a half weeks. Should be a good time! One of the highlights of any trip we take to Europe for me is getting to visit the immaculate churches. I’m not an overly religious person but the architectural details, artwork and belief in a higher power that it must have taken to build these structures over hundreds of years is mind-blowing. Today is a day that I’ve struggled to deal with lately. It’s been a year since I lost my father and I still miss him every day. There’s been a lot of self destructive behavior in the past few weeks and hoping with the passing of this day I’ll be better able to cope with other ongoing stresses.